I'm currently looking for collaborators/bandmates. Do let me know if interested. Every now and then, something so special enters your life that you feel as though it was created just for you. I've said that I was born with a Promethea shaped hole in my heart, and wasn't complete until I read it. It sounds melodramatic perhaps, but anyone who has had a similar experience with a work of art can relate I'm sure. It's like falling in love. Rather, it is falling in love - that real, rare kind which you know will last for the duration of your life. Promethea is a comic book series created by the illustrious Alan Moore. 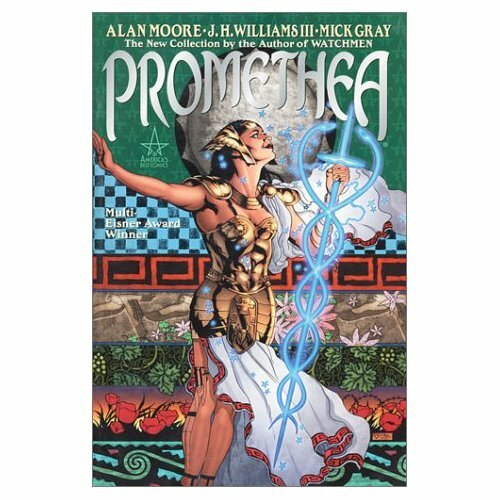 There is no way I can possibly do it justice, other than to say it is an ingenious treatise about imagination and magic, as well as a damn good yarn about a young woman named Sophie who discovers that she is the newest incarnation of a powerful demi-goddess (for lack of a better word) named Promethea. It is an absolute extravaganza, cram-packed with mysticism, the occult, alchemy, mythology, Tarot, Kabbalah, sci-fi, history, human emotion, and scathing satire about the modern world. And it has perhaps the most beautiful, most mind-boggling art I have ever seen in this medium, courtesy of J.H. Williams III. I don't want to give anything more away about this precious masterpiece. It is out in five trade paperback volumes. Do see for yourself. Promethea filled my heart as well. It is a stunning work. I purchased the hardcovers and the trade paperbacks, and even went back and bought all the single issues. I have extra copies of issue 32 to share/give to others. Did you make the poster out of that issue, and/or buy one...? Amazing! If you like Moore's thoughts on Mysticism, etc., look for an online copy of a loooong interview he did for the alternative weekly paper, Arthur. GabrielM on Salon de la Rose+Croix show at the Guggenheim! Stephen Romano on NYC Art Week Highlights Part 3! Katelaity on Georgiana Houghton show! Samantha on Belladonna of Sadness rerelease + book! stephen romano on "Saint Bowie" show at Stephen Romano Gallery! Brian Lucas on "Language of the Birds" in the New York Times and more!